Fred. Olsen Cruise Lines has once again triumphed at the ‘Group Leisure Awards’ after being voted ‘Best Cruise Line’ by readers of leading travel title, Group Leisure magazine, for a fifth consecutive year. 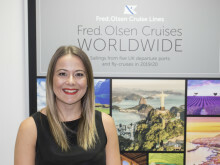 Having seen off competition from other finalists Norwegian Cruise Line, Saga Cruises and Viking River Cruises, Fred. Olsen was recognised at a special awards ceremony at the Hilton Birmingham Metropole hotel on 24th September 2014. The award recognises the very best groups cruise experience, from the initial booking process to onboard facilities, and the quality of excursions on offer. The ‘Group Leisure Awards’ were first established in 1997, and are voted for by active group travel organisers from sports and social clubs, retired associations, special interest societies and other groups, on what they consider to be the best groups experience across 21 categories. “We are delighted that our efforts to offer tailor-made packages for groups on board our fleet of smaller, more intimate cruise ships have been recognised in this prestigious way for a fifth year in a row. The ‘Group Leisure Awards’ dinner and ceremony were attended by some of the top names in the travel industry. Special guest comedian and ventriloquist Paul Zerdin entertained over 300 guests, before presenting the awards alongside Group Leisure magazine publisher, Rob Yandell. Feedback from Fred. Olsen’s group guests has shown that they are very appreciative of the excellent value for money that a Fred. Olsen cruise offers, as – in addition to the special benefits offered to groups – the cruise price includes all meals and entertainment on board the ship, as well as port taxes. They can also choose to upgrade to the ‘all-inclusive’ drinks package from just £10 per person, per night. Groups are welcome on all Fred. Olsen’s cruises and, depending on the size of the group, they may be eligible for a choice of added value benefits. There are many extras that can also be arranged to make the experience even more special, such as group private Traditional Afternoon Tea, group dining plans, private use of public rooms on board for group activities, private group shore tours and priority disembarkation for groups travelling by coach. Fred. Olsen's bespoke group’s service appeals to all types of groups, including family and friendship groups, corporate and incentive groups and all kinds of clubs, associations and societies, and larger groups will be pleased to know that there are no limits on the free places that they can earn. This Group Leisure award follows hot on the heels of Fred. 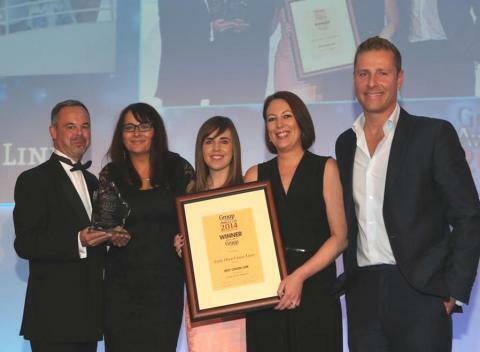 Olsen’s success at the ‘Cruise International Awards 2014’, where the cruise line was delighted to be voted 'Best for Enrichment’ for the third time. For group bookings and enquiries contact Fred. Olsen’s dedicated Group & Specialist Sales Department on 01473 746169 or e-mail group.sales@fredolsen.co.uk (Monday to Friday 9am until 5pm). Harold Burke, from category sponsor just for groups! (far right) presents Fred. Olsen Cruise Lines’ Ellie Fulcher, Group & Specialist Sales Manager (second from left), Sophie Austin, Group & Specialist Sales Executive (centre) and Lynsey Suffolk, Groups Assistant, withthe ‘Best Cruise Line for Groups’ award for the fifth consecutive year, at the ‘Group Leisure Awards 2014’ at the Hilton Birmingham Metropole hotel on 24th September 2014, alongside special guest Paul Zerdin. Fred. Olsen Cruise Line operates in the UK with four intimately sized ships for a more personal cruising experience. Prior to publication, it must be approved by Fred. Olsen Cruise Lines.